High Fidelity Stereo USB Computer Headset with Noise Canceling Microphone and Volume/Mute Controls. Our headsets are designed so you can get the most out of your PC audio experience, allowing for easy functionality at your fingertips, an adjustable headband and a flexible boom allowing perfect positioning to deliver the best voice transmission possible. 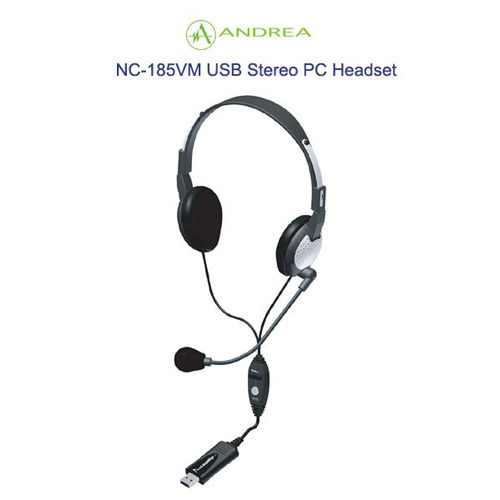 **This is the same headset as the Andrea Electonics NC-181, except the NC-185VM has dual speaker headphones and a PureAudio USB soundcard. Andrea Electronics has combined the benefits of PureAudio USB digital audio which includes Andrea's complete PureAudio™ Voice Solutions Software Suite (including Audio Commander, Voice Center and Pure Audio Technology) with our noise canceling computer headsets delivering a high fidelity audio experience with the highest voice recognition industry rating.